Byerly Park, a 93-acre multi-use recreation complex developed to improve to the quality of life for residents of Hartsville and the surrounding areas, is one of the finest sports facilities in the Southeast. The result of numerous land gifts to the City of Hartsville, the park is named for the Byerly Foundation, a longtime donor to the facility. Byerly Park offers year-round activities for both youth and adult athletes. Venues such as soccer, softball, baseball, football, basketball, volleyball, tennis and track and field are all inclusive within Byerly Park. Those who want to enjoy the outdoors and be healthy may use out 1.2 mile lighted walking trail, the Terrence J. Herrington Track or the fitness center in the Coach T.B. Thomas Sports Center. In addition, Byerly Park has a handicapable playground for our future athletes to play on and be a part of the action located in the heart of Byerly Park between the Tennis Courts and the Track. The Coach T.B. Thomas Sports Center has an indoor basketball gym, indoor rubberized walking track, strength equipment, cardio equipment including treadmills, elliptical machines and more, as well as numerous fitness classes every week. Neptune Island has a capacity of 1,300 visitors. 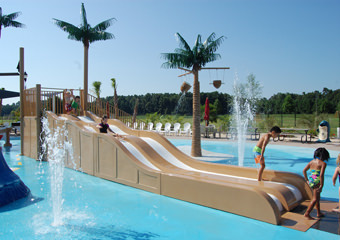 Guests can enjoy more waterpark features, including a 1,000-foot lazy river, a zero entry pool, a wave pool, a speed body slide, a pair of tubular water slides and three mat racing slides. Cabana rentals, party huts, and food trucks assist in making the new waterpark a celebrated destination for residents and visitors from throughout the region. 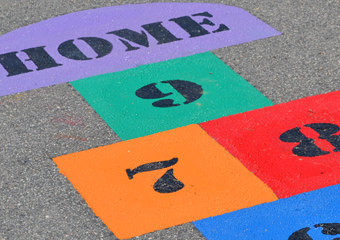 Byerly Park is home to the Born Learning Trail, a play feature for young children which gives them a chance to have fun while improving language and literacy skills. The trail is a series of easy-to-construct activities installed along the running and walking path near the tennis courts, helping adults to engage with their children to make a trip to the park a learning experience which enhances school readiness. The Born Learning Trail has been made possible by the United Way of Hartsville, Darlington County First Steps and Duke Energy. Byerly Park is the most heavily-utilized recreation facility in the City of Hartsville. Beyond regular classes and exercise use, the park plays host to many local youth and adult programs throughout the spring, summer, and fall. This multi-sport complex has also hosted many invitational, district, state, collegiate, and World Series tournaments. 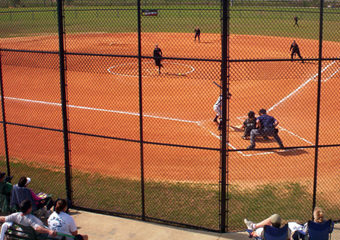 The facility has hosted Coker College’s Women’s Softball Conference tournament, and has also served as the site for several Dixie Youth, Dixie Boys, and the Dixie Girls districts, and states tournaments. In 2012, the complex hosted the Dixie Girls Ponytail World Series, its largest tournament event ever, bringing in athletes from 11 states for 5 days of competition. 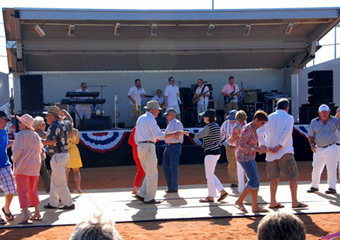 Byerly Park also hosts the Beach Blast, bringing together a variety of beach music bands for a day of fun, sun and dancing the Carolina Shag. 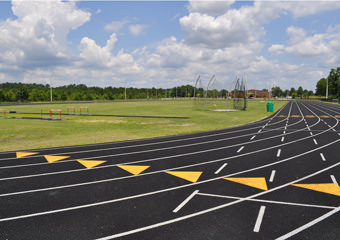 Byerly Park’s tennis facility and the Terrance Herrington Track and Field facility were created through a partnership between the City of Hartsville and the Darlington County School District. This mutual agreement has allowed the needs of the school district and the community to be met successfully. The Hartsville High School Tennis and Track teams have use of the facilities during their seasons but the facilities are always open to the public as well.